If there’s one thing guaranteed to entertain children it has got to be recording them making odd noises and then playing them back to them. 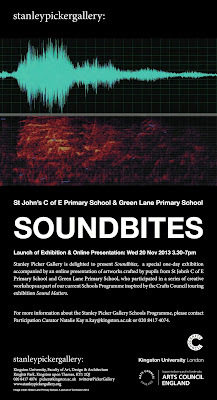 Surely with this concept in mind, the Crafts Council touring exhibition Sound Matters has teamed up with children from Green Lane Primary School (and also St John’s C of E Primary School) to create Soundbites, a one day exhibition and online presentation at the Stanley Picker Gallery in Kingston. I know this is rather short notice but if you are interested in seeing and hearing what the children have produced as well as other stuff, you can go along this afternoon to the Stanley Picker Gallery which can be found in the Faculty of Art, Design & Architecture at Kingston University, Knights Park, Kingston upon Thames KT1 2QJ. It will be open from 3:30 until 7pm. 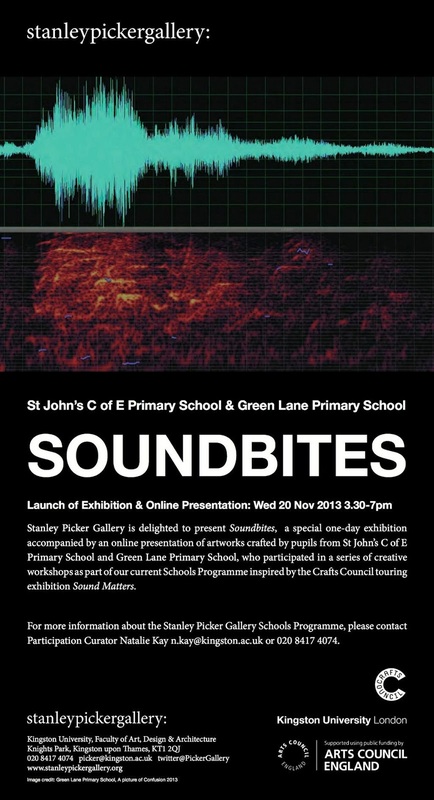 This is all part of their Sound Matters art exhibition which is all about exploring sound through forms. The children collaborated to compose, perform and record ‘noise only’ soundscapes inspired by self-made images, which included a robot, a car, a cat, graffiti and a selection of family photos. You can find out more here.